Hi there! Aly Dosdall here again, and today I’m sharing a holiday card set that I made using the Gifts Layered Stamps and some festive papers from the Falala collection by our sister brand, Crate Paper. Check it out! If you haven’t worked with the Layered Stamps yet, you should give it a try! They’re so much fun, and so easy to use. I’m not an expert stamper, but I really enjoyed creating with this stamp set. I love that I can customize the colors for my image so it coordinates perfectly with my project. There are three stamps in this set, and each builds off of the one before to create a multi color image that adds dimension to your projects. They’re numbered, so you know exactly what order to stamp them in. Start with the lightest color for stamp 1, and move sequentially to the darkest color for stamp 3. The Layered Stamps include a guide that helps you align each stamp correctly so that your final image is a success. The guide really takes the guesswork out of the process–I love it! I added a frame around each stamped image that I made with the Frame Punch Board and some papers from the Falala collection. Then I used a couple of die cut stickers from the collection for my sentiment and finished off each card with a few Sequin Stickers. Thanks for stopping by today. I hope you’re finding some helpful inspiration for making holiday cards. Be sure to come back tomorrow for a holiday card roundup. See you next time! Hello We R Fans! Kimberly here with a holiday card that is a ton of fun! The We R Memory Keepers Washi Chomper is a great tool for cutting washi. As I was thinking about making a holiday card, the idea of making a Christmas tree from washi struck me! The Washi Chomper makes cute flag ends on your pieces of washi tape. The washi tape is so adorable all lined up like this! One of the cool features of this tool is the fact that the white piece comes out. If you trim a small piece of washi, you can remove the white piece from the tool and take the tape off easily. I layered several colors and sizes of washi tape together. Honestly, I guessed at the length to cut the washi. I started at the bottom and worked my way to the top. A long piece to start with made it much easier. That way, if you do cut a piece of washi tape incorrectly, you can simply cut it again. This looks like a great way to include the kiddos in holiday card making! How will you use the Washi Chomper on your holiday card? Hello We R Memory Keeper friends and fans, Becki here to share with you this adorable set of holiday cards that I created with the brand new layer guides. These layer guides are a must have tool whether you’re a card maker, a scrapbooker, a planner girl, or a stamper. I’ve had so much fun working with these layer guides. These layer guides worked perfectly with the frame punch board. These cards are both created with the same basic design. Each card base is a 6” square created from vanilla textured cardstock. I started by creating a 3 ½” frame from patterned paper. The frame is adhered to the next layer (a 3 ½” square) with pop dots. Then, I cut five layers of patterned paper to go under each frame. Each layer is ½” larger than the previous layer. The layer guides made stacking these layers perfectly so easy! I love how quickly and perfectly these layers came together. In the center of the frame, I added one large embellishment and a die cut sentiment. The finishing touch on both cards is a button on each die cut. Creating holiday cards is one of my favorite things to do. I hope you’ll create your holiday cards with the Layer Guides. Thank you for stopping by the We R Memory Keepers blog. I’ll see you again soon! Hello and welcome to Holiday Card Week, We R Fans! I so admire really organized people… the ones that think ahead and organize things like holiday cards well in advance. I am more of a last-minute kinda girl who dreams of well managed time, lol. A small step in the right direction, are these little cards I created using some sweet Crate Paper Snow & Cocoa papers and a few of my fave We R tools. Can Christmas cards be black you might ask? Oh yes indeed! I am loving the way the red contrasts with the dark tones and the subtle pink and mint tones and cute characters are uplifting. This little card has a Bazzill Dotted base in ‘Pepper’ below some layered squares and mini embellies. I have used my very awesome new Square Punch Board to create a few squares which I’ve machine stitched together. Simply adjust the rulers on either side to create the size square or rectangle you need, then slide your paper in and punch. Simple as that! Here’s a little close up of this card. At 3×3 inches it’s a great size to hand out to my children’s classmates for end of year celebrations. This snowman card is 4×6 size and has some punched circles on it which I made using my Circle Clear Cut Punch. How fabulous is this holographic paper by DCWV! The Traditional Holiday 6×6 Stack comes with glitter, foil and lots of other awesome finishes – perfect for the holiday season. This cardstock is Bazzill speciality ’Black Tie’ and has a beautiful metallic shimmer to it. The card has been finished off with some hand cut elements and adhesive sequins. My third card uses Letterpress and some simple paper tags sewn together. I’ve run some black Bazzill basic textured cardstock through my Evolution Advanced with the ‘Happy’ sentiment from my Letterpress Kit. I’ve used white mixed media ink and it worked a treat! Some tiny handcut trees, a smidge of stamping and a bit of stitching finish this one off. Now to make a few more of these! Hello and Happy Friday friends! We hope those of you who celebrated Thanksgiving had a wonderful day yesterday and that you’re finding some great Black Friday deals today. If I would be lucky enough to win this give-away – I would use all of these basic tools to make Christmas cards, everyday cards, treat bags. We R Memory Keepers is my favorite – for everything. Always waiting for their next product. I already own almost all of them 🙂 – these would complete my collection, until the next release. Thank you for considering me. Happy Thanksgiving Week!! Congratulations Phoebe! Please send an email to alyd@americanccrafts.com with “Basic Tools Winner” in the subject line. Include your full name and shipping address, and we’ll get you your prize asap. Inspired by the circle templates built into the square guide, I decided to create an airbrushed background for my layout. Using four markers in different fall shades, I airbrushed directly into the circles in the Square Guide onto my cardstock. The Square Guide is easy to wipe clean, so I didn’t mind getting marker ink all over it. In fact, I used permanent markers for another project and was able to use a Mr. Clean eraser to easily get all the ink off the tool. As I started working on the rest of my page, my 3-year-old daughter – who had carefully watched the whole process thus far – borrowed the Marker Airbrush and made her own picture. It’s such an easy tool to use! I journaled with my Typecast, then embellished with fussy-cut leaves and flowers. I loved that I was able to create a quickie mixed-media layout with these basic tools, and I’m especially glad I was able to match the exact colors in my photos by using markers to airbrush instead of hunting down just the right patterned paper. If you’re looking for some easy to use, great basics to add to your crafting arsenal, I strongly encourage you to pick up the Square Guide and the Marker Airbrush! Hello We R Memory Keepers fans! Soraya here to share with you a layout using one of the new releases: the Marker Air Brush! This tool is fantastic for adding colors in fun way. You can use any marker you want, and it also works with watercolor pens. This is what I did for my layout. Your favorite embellishments can also become easy stencils with the Marker Airbrush! To make this layout I used the Frame Punch Board, the Marker AirBrush, watercolor pens and colorful papers from Maggie Holmes. First of all, I created five little frames using my Frame Punch Board. I love this tool so much ! You only have to cut squares and cards with the measurements you want and then punch them on this board to have a perfect border ! Those little frames will be perfect for showcasing the AirBrush elements. Then I placed all the frames on a white background and aligned them in the right position. Once done, I selected several embellishments (wood veeners and diecuts) to fill the frames: they will become stencils for a day! I took off all of the frames so as not to spoil them during the process! Now using my Marker Airbrush, I added the colors directly on the diecuts! And the magic happened: when I took them off, there was a beautiful splash of colors with all the shapes in white! With a thin black pencil I traced all the edges of the shapes: it adds more contrast! I replaced all the frames and started decorating all the parts of this layout with stickers, sequins and buttons. I also added more texture with some green twine for the ballons. And here is the final layout! How cool is the Marker AirBrush? I can’t wait to use it on my next projects. I’m thinking about making lots of cards! What about you? What would you do first with it? I hope you had fun joining me today, happy creating and until next time ! Hello everyone! Eva Pizarro here today on the blog showing you how to use the new Layer Guides to create a quick geometric layout. What I love the most about these Layer Guides is that I don’t have to measure and calculate the exact width of every paper I am going to use. I simply place the guide over my paper and use my x-acto knife to cut on every side. The guides have a catch-lip system that makes the job really easy and they won’t move while your are cutting! I started my layout with a 4 inch picture that I glued to a scrap piece of paper. I used my 3/8 inch layer guide and cut on each side. I did the same with several papers from the Constellation collection by our fiends at DCWV. I typed my journaling on the edge of my white cardstock using my Typecast Typewriter. I even ran my papers through with my alpha stickers attached! I placed my picture in the center of the page in a 45 degree angle. All the layers helped my picture stand out and become the focal point of my layout. Finally I embellished using a tone on tone technique and some die cuts and stickers from the Creekside collection by 1canoe2. The Layer Guides really made my work easy and because of the metal trim I know they are going to cut straight for a long time! Thanks for joining me today and have a great week! Happy Tuesday, We R fans, Laura here today! 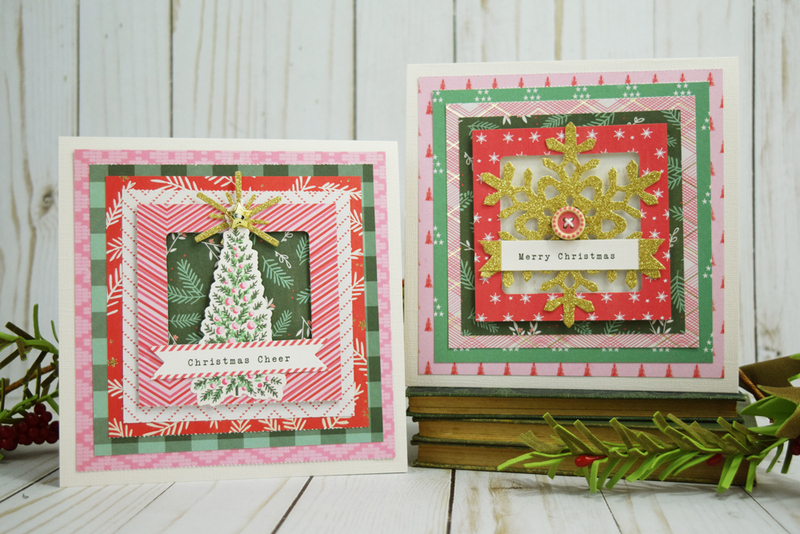 I am excited to be sharing this fun Christmas tree card you can make easily with the Tear Guides that are part of the new Basic Tools that have recently been released. I started by choosing some papers from the DCWV All About Christmas Stack. I love using papers from a paper pad because it is effortless to create a cohesive project that looks wonderful. I alternated between the two sides of the zigzag tear guide, tearing some of the papers with the large zigzag and some with the small zigzag. Lay the tear guide on your paper, and then pull the paper at a 45 degree angle to the guide. Go slow, and if you are using paper that is hard to tear, you can use the special water pen that comes with the guides. I found when tearing using the small side, it helped to have a little more paper to grab to get a cleaner edge. Once I had torn each of the papers I wanted to use, I trimmed them all to about 1 ½ inch by 5 inch strips using my paper trimmer. I attached the torn layers using my Sticky Thumb adhesive. Then, I used my paper trimmer to create a triangle shape with the attached strips of paper. This created my Christmas tree. I used a coordinating paper to create a card base for my tree. I attached the tree to the card base using adhesive foam dots. Since the patterned paper is only one sided, the inside of my card was white and blank. I used one of the sentiments I found in the paper pack and cut it out. I adhered it to one of the patterned papers I used for the tree on the front. Then, using the ½” layer guide, I trimmed the patterned paper to create a perfect ½ inch border around the sentiment card. I repeated this process with a second sheet of patterned paper. Then, I attached the whole thing inside the card. The tear guides make it easy to add some texture to your designs. There are three different guides that come in the pack – zigzag, wave, and deckle. These are so fun to use to add some dimension to your project. Basic Tools Week + a Giveaway! Hey there We R friends! Welcome to Basic Tools Week here on the blog. Our design team has cooked us some amazing projects to share with you featuring these must-have tools, so be sure to check in each day this week for new projects. First, we wanted to share some inspiration from our amazing in-house team, as well as some overview videos to help you get to know our Basic Tools collection. Then, scroll down to find out how to enter our Basic Tools Bundle Giveaway. Enjoy! Tip: use your favorite craft stencils to get this look! Tip: combine watercolor paints with the Marker Airbrush to get this look. Tip: use the included water pen with the Tear Guides for easy and accurate tearing. Now for the part you’ve been waiting for! Today we’re giving away one set of each of the tools in the Basic Tools line–that’s one Marker Airbrush, one Square Guide, one set of Layer Guides, one set of Tear Guides, and one Stapleless Stapler to one of you wonderful fans. If you’d like to enter this giveaway, please leave a comment below telling us what you would make with these crafter’s essentials. Comments will remain open until midnight on Thursday, Nov. 23rd. We’ll select a winner and announce them here on the blog on Friday, Nov. 25. Remember to check back to see if you won, and good luck! !